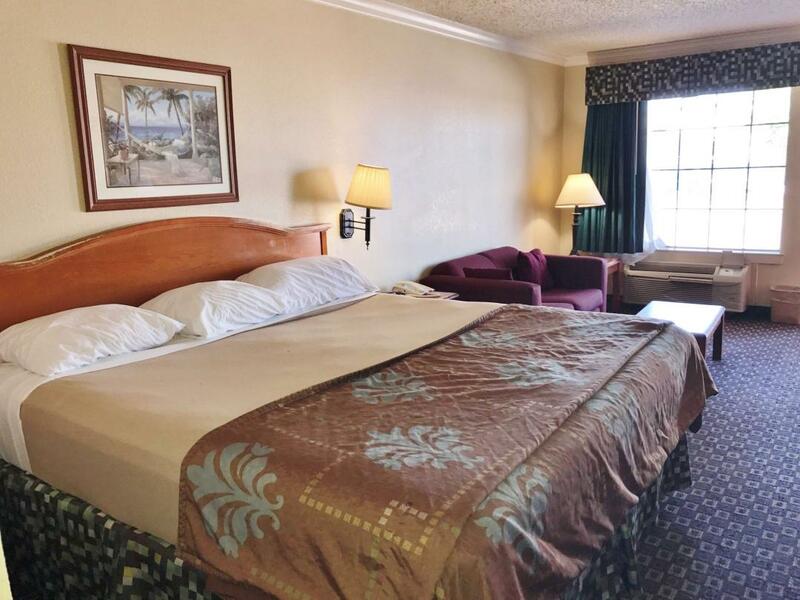 Americas Best Value Inn and Suites La Porte-Houston, Texas, is situated within the Bay Area of the Houston-Sugar Land-Baytown metropolitan area. We are conveniently located just off Highway 146 and only about 25 miles away from downtown Houston. The city's rich history invites you to visit nearby attractions such as the San Jacinto Battleground State Historic Site and Battleship USS Texas. Enjoy a leisurely day outside at the Kemah Boardwalk or visit the famous Sunset Sip and Stroll Farmers Market. Golfers can play a round at the scenic Bay Forest Golf Course, named one of the top 20 municipal courses in the state. For your dining pleasure and convenience, Americas Best Value Inn and Suites La Porte-Houston sits among a variety of eating establishments, some within walking distance. Local favorites include Baytown Seafood Restaurant, Blondie's Bar and Grill, Asian Wok, and Main 101 Grill and Bar. Guests are invited to enjoy the complimentary daily deluxe continental breakfast and coffee in the lobby. Featured hotel amenities include a guest laundry facility and business center. Take a refreshing dip in the seasonal outdoor pool, open from April to October. Take advantage of our business center equipped with computer and the guest laundry facility, open 24 hours. Whether traveling for business or pleasure, stay connected with our complimentary Wi-Fi available throughout the property. Complimentary on-site parking for all types of vehicles with outdoor plug-ins is available. One pet is welcome for a charge. From the privacy of your guestroom, enjoy such home luxuries as a sofa, microwave, mini-fridge, coffeemaker, hairdryer, 40-inch flat panel cable TV with ESPN, iron, ironing board, desk with lamp, table and chairs, and free local calls. Please inquire about upgrading to one of our jetted hot tub rooms or spacious suites. Americas Best Value Inn and Suites La Porte-Houston offers an ideal location, competitive rates, and exceptional customer service. Make it your place to stay when visiting the historic La Porte, Texas area. At Americas Best Value Inn and Suites La Porte-Houston, We've Got You Covered from the time you hit the road until your head hits the pillow. Enjoy free daily deluxe continental breakfast and coffee in the lobby. Baytown Seafood Restaurant, 0.4 mi. Blondie's Bar and Grill, 0.4 mi. Jack in the Box, 0.4 mi. Popeyes Louisiana Kitchen, 0.7 mi. Village Pizza and Seafood, 1 mi. Main 101 Grill and Bar, 1.3 mi. Check out these La Porte attractions during your stay. Little Cedar Bayou Wave Pool, 1 mi. Vicki's Antiques on Main, 1.2 mi. Sunset Sip and Stroll Farmers Market, 1.3 mi. Sylvan Beach Park, 1.4 mi. Bay Forest Golf Course, 1.7 mi. Crow's Nest Art Gallery, 1.7 mi. Lovely Nails and Spa, 5.8 mi. Armand Bayou Nature Center, 6.2 mi. iT'Z Family, Food, and Fun & Pasadena, 7.8 mi. Cinemark Hollywood Movies 20, 8.9 mi. Sonja Angelo Theater, 1.2 mi. Houston Yacht Club, 4.7 mi. San Jacinto Battleground State Historic Site, 10 mi. Rogue Outdoor Adventures, 10.2 mi. Battleship USS Texas State Historic Site, 10.5 mi. NASA Johnson Space Center, 10.9 mi. Pasadena Historical Society, 13.8 mi.